I personally love this time of year. The beginning of the year allows for businesses like mine to organize and, possibly find new products or systems that can help them in the upcoming busy season. That is exactly what I have found recently with Sherwin-Williams new Emerald Interior Trim Paint. Using hi-tech nano technologies, this product is the Apple Iphone of paints! 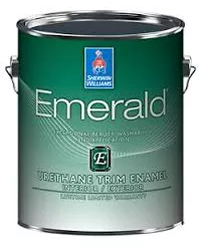 A vast improvement over many of the other trim paints they have offered to the contractor and retail markets Emerald Urethane Trim Enamel is the water clean up equivalent of an oil based paint our grandparents would have used. We enjoy this product because it simply lays down better than anything we have ever used. The goal when painting trim or doors is to have minimal brush and roller marks when the product is dry and Emerald delivers on that (provided you use the correct tools). It even sprays better than its predecessors when using a 410 spray tip. Also, no thinning needed! Just load a go! Next time you have a trim project, use Emerald Urethane Trim Enamel, you’ll be glad you did.